In the time of the Han Dynasty, 206 B.C. ~ A.D. 220, clay figurines resembling a dog have been found in numerous burial sites. Similar depictions have been found in period art work. Historians speculate that these “tomb dogs” are possibly the ancestors of the Shar-Pei due to the brow wrinkles shown on the statue and the curled tail, height and build depicted in early artwork. Much of the potential history was lost as Emperor Yuan, during the Mongol Dynasty (1260 ~ 1368) destroyed 140,000 ancient books rather than let them fall into unworthy hands at the anticipation of his certain death. Further information has been lost as the Communist took over China. Generally accepted, however, is that the Shar-Pei most likely was a common dog. A peasant or “peoples” dog kept by farmers to help protect property, guard livestock and general companionship. In China any and ALL dogs that were used for protection of property or livestock were called “fighting dogs” as opposed to “guard dogs” as known in the USA. The village of Dah Let (Tai Leh) in Kwun Tung Province, located near Canton, in the south of China, bordering the South China Sea was known for the sport of dog fighting. It is thought that this is the birthplace of the breed as gambling men, looking for an edge, may have introduced the Sharp-Pei, or his ancestors, to the fighting ring. The Shar-Pei, by nature, was not an aggressive animal even though once provoked was a determined fighter and would fight to his own death. Inducing drugs was thought to be a practice to make the Shar-Pei more aggressive as was breeding them to more aggressive species to produce a sturdy, vicious and flexible fighting machine. Wars and famine ravaged China and the Shar-Pei, as well as other breeds found themselves “on” the table, instead of bringing something “to” the table. Having relinquished it’s role in the fighting ring combined with over breeding gave abundance to the breed to a country that was starving. Never in such grave danger as the “Chow” some Shar-Pei were selectively chosen as a meal due to a particular dogs lack of strength, character or intelligence. It was far easier to just eat the dog as opposed to feeding an inferior subject. The basic disinterest in all dog breeds peaked during the Ming Dynasty (1368 ~ 1644) and resulted in sharp declines in canine populations. The Shar-Pei survived these times and managed a coexistence with man until the Communist took over China in 1940. Pets were considered a luxury and therefore heavy fines and taxes were imposed for their possession. Further, Mao Tse-Tung (Mao Zedong ~ 1893-1976) ordered a mass extermination of all breeds after determining that pets were a symbol of privileged classes. By the 1960’s the Shar-Pei was virtually extinct. In the early 70’s a small group of interested parties searched intensely for the last surviving members of this breed. Two gentlemen in particular were C.M. Chung, a breeder of Shar-Pei and Matgo Law who had recently become interested in the breed. Their intentions were to try to resuscitate this vanishing breed. They were able to acquire a small number of dogs and set out to develop a plan to re-establish this endangered breed. Matgo Law bought his first Shar-Pei from a basket on the streets of Hong Kong for 80 Hong Kong dollars. His second Shar-Pei was Down-Homes Sweet Pea, pictured left, which was a gift from a dog fighter. Sweet Pea was his foundation dog and a primary ancestor for almost every known Shar-Pei in existence today. Mr. Chung and Mr. Law were busy assembling a plan for the rebirth of the Shar-Pei and trying to acquire a solid, however small, foundation stock containing the traits of what they thought the breed should possess. Quite by accident a May, 1971 issue Dogs Magazine fell into the hands of Mr. Law. This issue carried an article on rare breeds which included a photo of a Shar-Pei and claims that it was possibly among the last surviving specimens of this rare breed. Mr. Law could not have anticipated the tremendous response and only about a dozen dogs were ready to be imported into the USA. Mr. and Mrs. Albright, Mr. and Mrs. Victor Seas, Ruth Fink, Lois Alexander and Mr. and Mrs. Ted Linn eagerly accepted the first puppies imported into the USA by Mr. Law’s Down-Homes Kennel. Slowly they began to trickle in as Mr. Law searched his homeland countryside feverishly for more quality breeding stock. Han Dynasty – Clay figurines found in burial sites thought to be representative of the Shar-Pei. Mongol Dynasty – Emperor Yuan destroys 140,000 ancient books and much potential history of the breed. Ming Dynasty – Famine and wars reduce dog ownership and interest (except for food). Mao Tse-Tung – Life span of what many consider the most powerful (and cruel) man to ever rule. A heavy tax is imposed on companion pets in China to discourage ownership. Only the wealthy own pets. Communism and Mao Tee-Tung take over China and raises dog taxes on the existing dogs. Later he orders a mass extermination of all breeds. Some of the breed were smuggled off Main Land China and survived in small numbers on the islands of Hong Kong, Macao and Taiwan but ironically many were used in dog fighting rings. The Chinese Shar-Pei is virtually extinct with only a few specimens existing. C.M. Chung, Jones Kennel, exports five Shar-Pei to the US. Three of the five are registered with the HKKA (Hong Kong/Kowloon Kennel Association). Late 60’s the Guinness Book of World Records list the Shar-Pei as the world’s rarest breed. The Hong Kong Kennel Club discontinues registration of the Shar-Pei due to current applications no longer resembling the former registrars. Three litters are whelped and the pups registered with the ADBA. 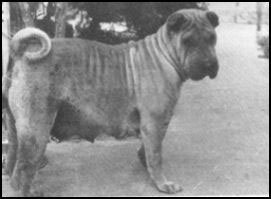 Oct. 8 – Herman Smith’s Lucky, is registered by the ADBA (American Dog Breeders Association) as a Chinese Fighting Dog four years after his arrival as the first Shar-Pei to America. This was a courtesy to Herman Smith and the ADBA opened a brand new stud book, Vol. I, for the breed and issued “Lucky” # 001.00. Not to be confused with on the same day the ABDA registered 2 dogs to J.C. Smith, named Bigoo (#003) and Roro (#004) and Faigoo (#005) was registered to Darwin D. Smith. These 5 Imports as well as 4 of their adult offspring were registered on this day and a lot of them to people named Smith. 14 dogs registered with ADBA as a Chinese Fighting Dogs. The May issue of Dogs Magazine accidently falls into the hands of Matgo Law. Focusing on rare breeds and claiming that Shar-Pei photos shown were possibly one of the last examples of the breed. The April issue of Dogs Magazine contains a plea from Matgo Law for compassionate US breeders to assist in helping rescue this vanishing breed. The first Shar-Pei imported from Down-Homes Kennel. Mr. and Mrs. Victor Seas receive Down-Homes Kung Fu. The second Shar-Pei imported from Down-Homes Kennel. The Albrights receive Down-Homes Mui Chu and a few weeks later receive Down-Homes China Souel. Lois Alexander receives the third Down-Homes export when Down-Homes Little Pea arrives at the San Francisco airport. She is pregnant Hong Kong after being bred to her father, Down-Homes Sweet Pea in Hong Kong. Down-Homes Mui Chu becomes the first Shar-Pei to be shown in the United States when she appears at the Golden Gate Kennel Club Show. The Albrights receive their 2nd dog, Down-Homes China Souel, from Matgo Law. CSPCA Meeting 1: The Original Chinese Shar-Pei Club of America is formed after a meeting of Mr. & Mrs. John Purcell, Mr. Ernest Albright and Mrs. Lois Alexander meet at the home of Mr. & Mrs. Carl Sanders in Ashland, OR (absent: Tom Parker). The name Chinese Shar-Pei was decided as the breed name and the name Chinese Shar-Pei Club of America (CSPCA) was chosen for the organizations name. CSPCA Meeting 2: The Original CSPCA appoints Renee Lew as representative to the AKC as preparations are made to meet compliance and have the Chinese Shar-Pei be recognized by the AKC. CSPCA Meeting 3: At the Albrights home the members decide that the Shar-Pei should be shown in the Non-Sporting Group, set up a point system for the Specialty Match and decide to join the National Rare Breed Club. The “Barker”, the official CSPCA Magazine, published it’s first issue. CSPCA Meeting 4: The Original CSPCA now has 19 members and passes the Official Standard of the Chinese Shar-Pei which will be effective for 5 years until 1981 which is an AKC required guideline. The CSPCA issues it’s first registration number to Down-Homes China Souel owned by the Albrights. Guinness Book of World Records, for the second time, lists the Shar-Pei still as the “rarest breed of dog in the world”. Chen Cheu, owned by Shirley & Dugan Skinner, was pictured. Matgo Law judges his first American Dog Show, the 1979 Annual Specialty Show, in San Juan Capistrano, CA. The Official Standard of the Original CSPCA, adopted on 2/22/1976 is sent to it’s members. Chinese Shar pei recognized by FCI, First standard accepted by FCI, Country of standard patronage is Hon Kong. The CSPCA membership roster has 5497 voting members with 30 applications per week. The Shar-Pei is no longer the rarest breed in the world. First shar pei in Czech Republik – Owner Hana Petrusová. First shar pei registered in Slovak stud book – Owner Tibor Matis. First shar pei in Slovenia – Owner Lidija Kolenc. American Kennel Club approved revised breed standard. First shar pei in Russian federation – Owner Elena Kulisheva. AKC accepts Chinese Shar-Pei into the Non-Sporting Group. Date of publication of the official valid standard – Standard patronage is FCI. Online journal Nature – Shar pei is the most ancient of dog lineages, according to a new study of doggie DNA. Results of study show the greatest genetic similarity to wolves of all of the breeds studied, the research found. Chinese Shar pei recognized by FCI, Country of standard patronage is Hon Kong.